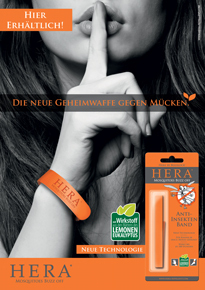 Welcome to HERA® by BUGSLOCK® – HERA® Anti insect products. HERA® – The technological innovation against unpleasantinsects (Mosquitoes/Ticks). Highly effective and with a new, modern design,our HERA® products reliably protect mosquitoes and insects away with a high fragrance barrier. Click here for your trusted pharmacy! HERA® ANTI INSECT ROLL ON – PZN Austria 4491911 / PZN Germany 12457621.